I recently bought a new mouse, and I thought why not I make a post about peripherals. I have some friends who are looking for gaming gears recently, and I notice what I think is common knowledge is actually not that common. There are also Starcraft specific settings that many don’t know about. I am no expert in hardware, so it is just sharing of experience and a little bit of research. This “cheap” post is not in my planned topics. I actually have been working on some other posts (e.g., mobile mech build in TvZ), but the upcoming patch basically changes things. I also have another post drafted regarding the patch, but Blizzard made another announcement shortly after that to confuse things. If you want to read my opinion on the direction that Blizzard are going with this, you can read my previous discussion here. In case you are wondering what is the stand that the mouse wire is attaching on to, it is a mouse bungee. It basically does what you see, and that is to hang on to the wire. Before I even know the existence of a mouse bungee, I had experience problem with the wire of the mouse “pulling” my mouse when I move. I actually made my own bungee just to ensure the wire pulling didn’t get in my way. 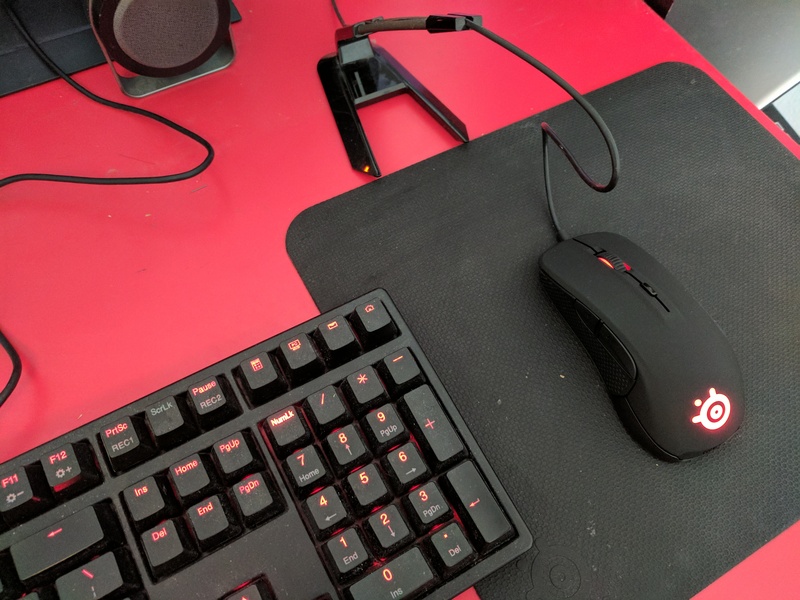 I bought a Razer one when it was on discount in a shop, and I assumed it was because no one wants to buy a mouse bungee. 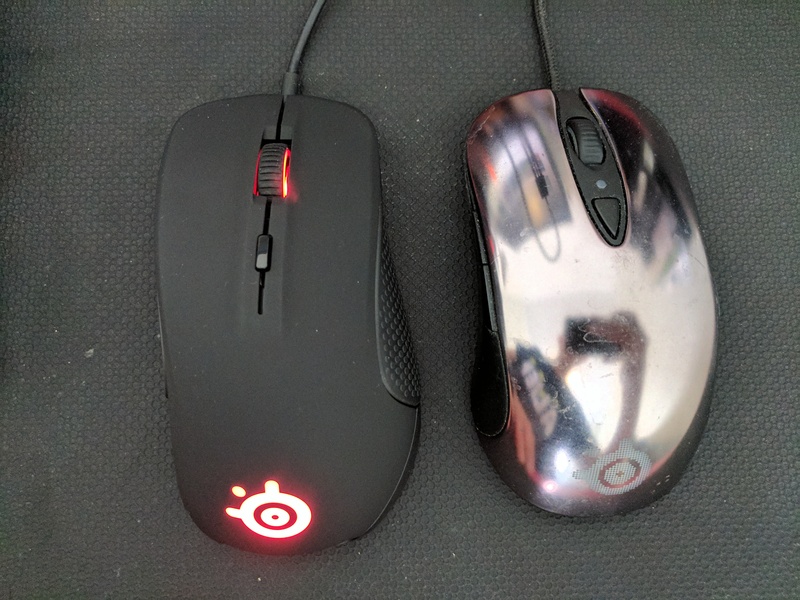 I just switched my four year old Steelseries Sensei for a new Rival 300, because the buttons have lived past their life span. The actuation point is so short and sensitive that it always registers as double click when I only single click. When I select a worker to go to the gas geyser, all my workers are selected due to the double click and nothing mines mineral any more. Let’s not even talk about more advance micro. It is pretty amazing how fresh my old Sensei looks after four years, as I have seen others’ seasoned Sensei had the silver top rubbed off. The area in contact with the hand usually turns white based on what I have seen. A few months ago, I switched from Steelseries 4HD (six year old) to Steelseries Dex, because the surface is so worn out that the cursor moves by itself when the mouse is stationary. I will explain my choices as I discuss about why certain types of items fit certain preferences. If you are on a budget, I recommend you to prioritise getting a mouse over any other items. You can definitely feel the precision difference between a “gaming” mouse (doesn’t have to be top end) and a standard office mouse. Grip type is something that I am surprised how many people overlooked. I think this is the main reason for someone to regret a purchase. There are three main grips: palm, claw and fingertip (or just tip). I will not go too much into it, as I believe it has a lot to do with preference. You can read more about it here. Most use palm, and I use claw. Palm is probably the most relaxed way to hold the mouse, and I believe only RTS players use claw. This should be due to the fact that the cursor is in the middle of the screen most of the time, and the claw grip allows you to move the cursor to the middle by pulling with the “claw”. I developed this grip habit since I was playing Warcraft III. Also, an ergonomic mouse may be more suitable for palm, while an ambidextrous mouse may be more suitable for claw. As you can see from the image above, different mouse shapes fit different grips. Thus, while an online review is a good source of information, you need to ensure it fits your grip. A friend bought a Razer Deathadder, which is highly rated by many reviews, and he didn’t like it. It actually hurts his hand and wrist, simply because his grip does not fit the shape of the mouse. On top of the standard grip categorisation, some may have more unique preferences. For example, I like to put my middle and fourth fingers on the right click (see image above). Most people have the middle finger on the right click, and the fourth at the right side of the mouse. This may seem like a negligible difference, but this makes mouses with certain type of edges or concave at the side of the buttons a pain to me (see image below). Such features are usually designed to prevent your finger from slipping off the button, but they do not fit my rather unorthodox grip. Therefore, even though you can rely on the grip description of the mouses for your choices, it is still highly recommended to try it out physically if you can. Basically it is a product category with a high preference heterogeneity. 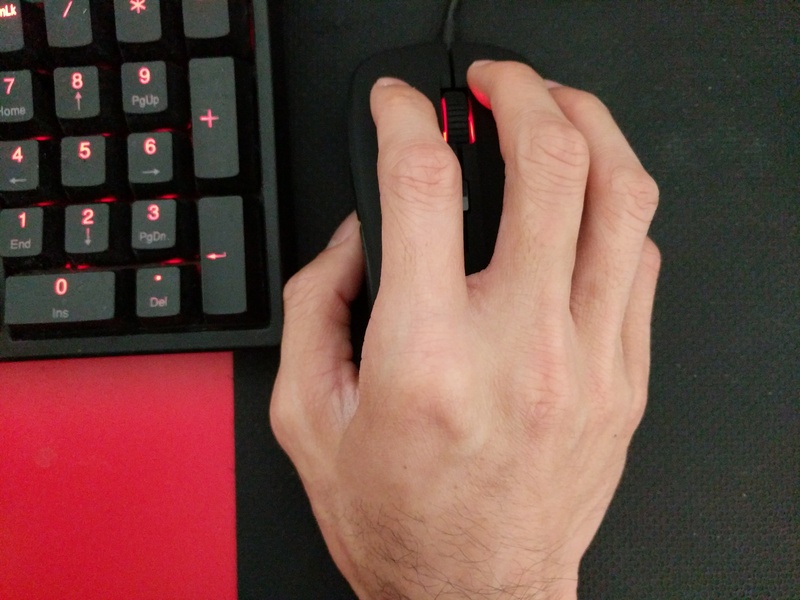 My fingers positioning explains why I don’t pick Razer, as all their mouses have this edge feature. There is also a bit of a brand loyalty thing with Steelseries, because I had Xai then Sensei. Xai and Sensei save settings in the mouse itself, and it is a big plus for me in the older days. Interestingly, my first mouse is a Razer Copperhead, so I have used Razer before in case you are wondering. Before you think I am advocating for Steelseries, I must stress that I hated their 6Gv2 keyboard. Even though it is designed to sustain heavy duty (e.g., rage slamming lol), the plastic caps come off easily. It actually stuck to my finger tip and came off, then the bottom of it broke when I pressed down again. Damn it. This is again something of a preference. I personally prefer heavier mouse, as you can tell since I use Sensei and Rival 300. Laser versus optical is considered a controversial debate. Unless you are really geeky, I will say you can basically ignore it as you probably will not feel the difference. In fact, laser is essentially optical anyway. You can read more here. I suspect this may be affected by the surface used. But oh well, what do I know about this. Some call it DPI, while others call it CPI. I am no expert in this, but it appears that they are the same thing to a layman. They stand for dots/counts per inch. In layman term, this is basically sensitivity. I found some good articles on this (here and here), and I doubt I have enough understanding to discuss much in technical terms. However, this actually gets more complicated with the Starcraft engine. You should watch the video below to understand how the mouse sensitivity settings in the game setting work. In short, you should select enable mouse sensitivity and set the in-game sensitivity to 52%. Then, you can just rely on your actual mouse sensitivity setting. More specifically to Starcraft, I recommend you to use DPI/CPI of around 800 with a 1920×1080 screen. It is considered the sweet spot for the mechanics requirement in Starcraft, and many progamers use around 800. I was using 1000 on my Sensei for years, as it allows me to move the cursor from one end to the other horizontally without lifting my wrist pivot with a close to maximum movement. Interestingly, I had to tune it down to 800 with my new Rival 300 on the same surface. I don’t understand the difference, but apparently I am not the only one with conversion issue after a few google search. Let me know if you have a good explanation. I have this funny story to tell before I get down to the discussion. I only brought the essentials when I moved to Sydney, and I packed some stuff that I told my mum to mail over after I had settled down. Those things include mouse and keyboard. When I received the box, I noticed the mouse pad was missing. She said she didn’t think I need a mouse pad. Then, a few months later, I realised she removed my belt too. Yes, a normal belt that you put on your pants, and it is not a hardware lol. That belt is my “suit belt”, and I had a hard time finding one to use for my friend’s wedding. I asked her why she removed items from the box selectively when she could just mail it over as I have packed it, and her reason was basically… I couldn’t remember, but I know it is something that didn’t make sense. GG NO RE. The point is, the surface that she didn’t send over is a Steelseries 4HD, and I had to buy a Steelseries QcK from a local shop. 4HD is a hard mat, which is said to be designed for laser mouse like Xai, and later its successor Sensei. On the other hand, QcK is a basic cloth mat for any mouse. Marketing aside, I actually can feel the difference of the two when I use Sensei on both. They seem to track differently, so the “perceived sensitivity” is different as an outcome. I still remember when I first glided a Xai on a 4HD. It is like, woooooo… sweet… The amount of friction just feels right, if that even makes sense. I think it may be wise to simply get the recommended surface for the mouse if you are not too sure. Razer Goliathus seems to be the most popular choice among Starcraft progamers. People often ask what are the differences between a normal (i.e., membrane) keyboard and a mechanical keyboard. Well, the most obvious difference is the price if you have not noticed that. You can read more about the differences just by googling, or here. The key question is whether a mechanical keyboard performs better at gaming. I will say yes, because the key presses are more consistent. A membrane keyboard has a “one-piece” rubber for all the keys, and the key “loosens” up quickly. The more often pressed keys require a lot less effort to press down than the less often used ones. I actually had an experience in this when I bought a basic $10 Logitech office keyboard for Warcraft III, and I bought one for my mum three months later. The difference between the new and the three month old keyboard is obvious when I put them side by side. The commonly used keys on my three month old one are very soft in comparison. In contrast, a mechanical keyboard has individual switches for each key, and they do not get worn out that easily. I have used mine for four years, and it still feels fresh. Although many say the mechanical switch almost doesn’t wear out and it feels the same after years, it is only fair to say that it simply wears out a lot slower. After four years, my “A” key is softer than other keys that I don’t use, like F12. However, most importantly in gaming, the key press is still a lot more consistent than a typical keyboard. Don’t get fooled when you purchase a “gaming” keyboard. Many of such “gaming keyboards” are not mechanical keyboards (for example). 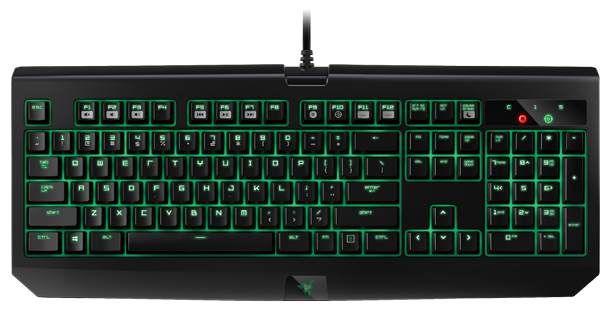 Generally, you don’t want a “gaming” keyboard, but you want a mechanical keyboard. It is just that many gaming keyboards are mechanical keyboards anyway. There are many other non-gaming oriented manufacturers for mechanical keyboards, for example, Filco and Ducky. After all, it is just much more pleasant to use a mechanical keyboard, and it is hard to go back once you have tried it. It makes typing a lot more enjoyable too. Many in my office use mechanical keyboards even though they don’t play games. You may have heard of Cherry MX switch, as it is the Intel of mechanical keyboard switch. Many keyboard brands use it as it is the industrial standard and it has a high brand recognition. 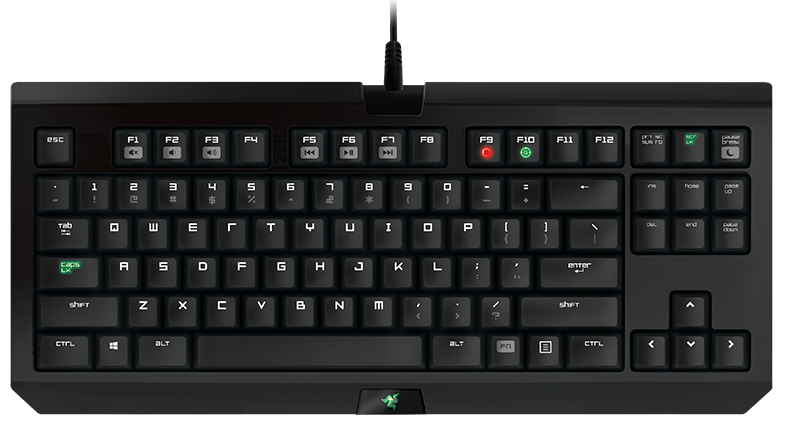 Razer is an obvious mainstream brand that does not use Cherry MX switch in its mechanical keyboards, but their “green” and “orange” switches are comparable to the “blue” and “brown” of Cherry MX switches. There are four mainstream Cherry MX switches: blue, brown, red and black. I strongly recommend you to read up on the differences here. Broadly speaking, you can categorise them into linear (black and red) and tactile (brown and blue). As implied by the name, linear goes straight down without any “click” and it is smooth. If you want a linear switch, you should get red. My personal recommendation is to never get black, because it requires more force than others. My fingers got tired after a while. Really. Both brown and blue are tactile. As you can see from the GIFs above, they have an arc that works as a threshold to let you have a feedback feel. Many mainstream marketed gaming keyboards use the blue switch, but I personally think it is less suitable for gaming than brown if you want a tactile one. This is because the release point is above the actuation point. In other words, you have to release fully before you can press down again, so it is hard to click in succession to spam. This can be an issue when you select many Barracks and try to click “A” multiple times to produce Marines. I believe the reason behind the popularity of blue switch in gaming keyboards is the clicky feel and sound, as a layman can easily differentiate it from a normal keyboard. A good way to describe blue is that it feels like clicking down a pen. I use brown because I like the tactile feedback, and I don’t want to have the release point issue. The different keyboard layouts usually don’t affect gaming, because the affected keys are usually not used. However, there are two specific things I want to bring up. First, it is the function (Fn) key at the bottom row. Some have it and some don’t, and they are also at different places. The function key placement affects the placement of the ctrl, alt and window keys. Second, the placement of the F1 key at the top, and it is often overlooked. The difference is usually quite subtle, but it affects gaming performance. Many use the F1, F2, F3 etc. for camera hotkeys, and it is important that they are where you find them comfortable. I will use Razer BlackWidow series for example below. The first is Ultimate Chroma, the second is Ultimate Stealth, the third is Tournament Edition and the fourth is Ultimate. The third and fourth have the F1 key in line above the 2/@ key, but the first and second don’t. I prefer the F1 key to be in line above the 2/@ key.